Norwegian company Opera Software released a new version of the Developer Edition of its web browser today that ships with a free built-in VPN option. 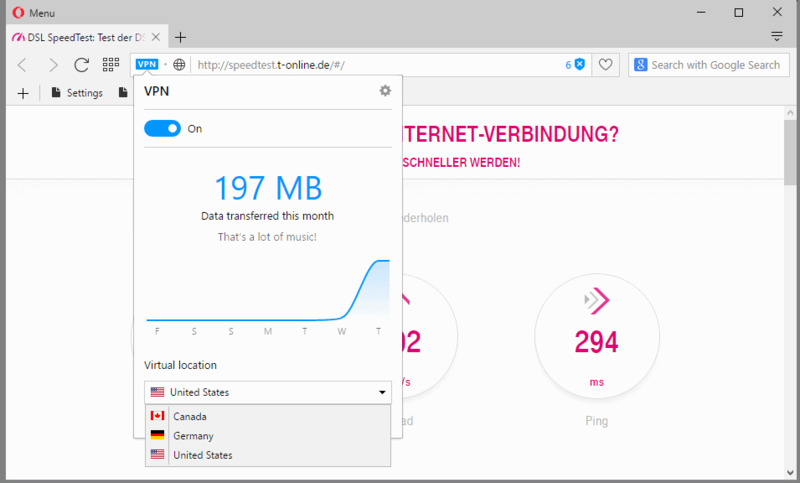 Opera browser is the first major browser that ships with built-in VPN functionality to improve user privacy and security while connected the Internet. When Opera Software acquired the VPN provider SurfEasy in early 2015, I stated that it would make sense for the company to integrate the VPN service into the web browser. Nothing came out of it in 2015 though except for promoting the VPN in Opera's private browsing mode. This changes with today's release of Opera Developer 38 which brings access to the virtual private network service free of charge to all users of the browser. The VPN enables Opera users to better protect their Internet activities while using the browser, for instance while connected to public networks but also when using home connections. I asked Opera about the VPN, and the company confirmed to me that it is indeed powered by SurfEasy. Opera told me that it is completely free and not limited in any way. Additionally, no user data logs are being kept by the company. Load opera://settings/ in the web browser's address bar. Switch to privacy & security using the sidebar menu. Scroll down until you find the VPN section. Check the "enable VPN" box. And that's it. Opera will make use of the VPN from that moment on for all connections the browser makes. This means that your "real" IP address won't be visible anymore to websites (unless they use other means of detection if available), and that your connection is encrypted which prevents eavesdropping. You can verify that the VPN is working by loading our IP checker using Opera and another browser you have access to. The IP addresses shown to you should be different as Opera uses the VPN while the other browser does not. The Opera browser displays a VPN icon in the browser's address bar when the virtual private network connection feature has been enabled in the settings. You can click on the icon to display data transfer stats and switch to another virtual location. The current implementation supports servers in the United States, Canada and Germany. There is also an option to turn the VPN on or off quickly using the interface. This can be useful if services on the Internet block you from accessing them (..Netflix..) when you are using a VPN or proxy, or when you want to a direct connection to a service. The VPN connection is limited to the Opera browser, but it appears to work really well. I ran some tests, DNS leak, fingerprinting and speed tests, and all returned good results. Speed tests revealed that the bandwidth you get when connected to the VPN depends on the server location of it. The German server maxed out my 50Mbit/10Mbit connection almost completely while I got 35Mbit/8Mbit on the US server. Still, both are sufficient for HD and 4K streams, and most other activities on the Internet. (The server is blocked by Netflix however which means you cannot use it for that). It is unclear right now if and when the feature will land in Opera Stable. In the most optimistic case, it will become available in Opera Beta in the next release cycle, and then in Opera Stable in the release cycle after it. Still, it is likely that Opera will keep an eye on the service, especially on bandwidth and availability, before it moves it to Beta or Stable versions of the web browser. Integration of the VPN service distinguishes Opera more from other popular web browsers who don't ship with such an option currently. This is especially important when compared to other Chromium-based browsers such as Google Chrome or Vivaldi, but also other non-Chromium browsers like Firefox or Internet Explorer/Microsoft Edge. The integration is beneficial to users as it improves privacy and security while using the browser, and because it may be used to circumvent censorship and other restrictions. Like Jaguar & LandRover are now Indian companies. Marc, I was under the impression that while the board agreed to the acquisition, it has not happened yet. But it is difficult to tell as information are scarce at the moment. Jaguar & LandRover most likely have Chinese backdoor and tracking software. No doubt you have site checking enabled in the settings. A lot of modern browsers support this feature and enable it by default. Just turn it off. You are very smart too, not knowing the difference between intelligence and knowledge. Smartest person ever. Try setting it to the German server, then go to whatismyipaddress.com. You’ll see a different ip address. Each time I’ve installed Opera I also got Google Chrome which I hate. Where did you get Opera from? Most people think they’re protecting themselves but they’re actually making the original problem worse. I’ve been using Epic Privacy Browser now for more than a year which includes a VPN. It’s work well so far. Epic is a chromium based browser and the chief complaint is that it’s not very customizable. But it’s quick and seems to be everything it claims to be. I’ve been using dns crypt to bypass my country’s dns poisoning. Can this opera VPN bypass dns poisoning? Most of the user reviews are very negative. Opera’s VPN is just an HTTPS proxy: https://www.helpnetsecurity.com/2016/04/22/opera-browser-vpn-proxy/ It acts like a VPN for web traffic inside the Opera browser but that’s not what a VPN really is. A true VPN will connect two *computers* at the OSI Layer 2 or Layer 3 level. I use to think that Opera Turbo works like VPN because I could bypass our country’s internet censorship by using Opera Turbo…. What do you think, Martin…. Is it true that Opera Turbo works like VPN, isn’t it? While it looks the same on first glance, it is not. First, Opera Turbo compresses web traffic, and second, it is not being used when you connect to HTTPS sites. This is a great news, a browser with a built-in VPN. However, one very important thing that is missing in this puzzle is that it can only work for the browsing through Opera browser. All the other activities including mail client, cloud etc will remain open for hackers. This is the biggest reason I think people should keep using premium VPNs like Ivacy VPN.